Sloutskin, A. and Goldstein, R. S. (2014). Infectious Focus Assays and Multiplicity of Infection (MOI) Calculations for Alpha-herpesviruses. Bio-protocol 4(22): e1295. DOI: 10.21769/BioProtoc.1295. Titration of viral stocks is a critical process before any experimental use of the virus. 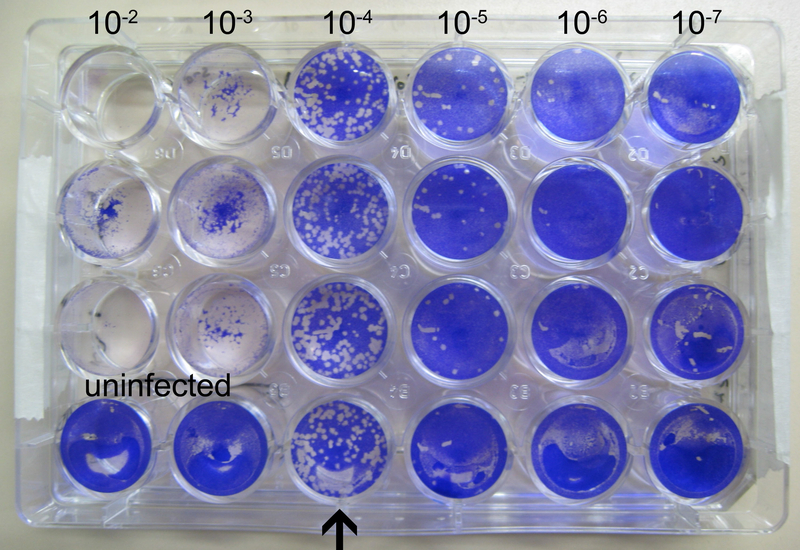 Here we describe an infectious focus assay for several alphaherpesviruses, a titration method for fluorescently labeled viruses, based on the original plaque assay. In addition, the calculation of multiplicity of infection (MOI) is presented. Note: However, it can be any other medium for other pairs of virus and cells. Grow MeWo or ARPE19 cells in a 24 well plate until they reach 90% confluence (~300,000 or 200,000 cells/well when seeding ~24 h before the infection, respectively). Use 500 µl/well volume to grow and infect the cells. The use of MeWo cells for VZV is documented in Heineman and Cohen (1994), Eisfeld et al. (2007) and Markus et al. (2011). Prepare 10-fold serial dilutions of VZV-infected MeWo cells. Typically, the range of the dilutions is 10-1 to 10-6 of the initial stock. The volume inoculated to each well can range up to 500 µl. Add the infected cells to the 24-well plate containing the 90% confluent naïve cell cultures in triplicate and incubate at 37 °C for at least 2 h. There is no special need to replace the medium after the addition of the inoculum, therefore the infected-cells can be left overnight as well. No agar overlay is required as no secondary plaques are formed by VZV, which does not release virions into the overlaying medium. Using a 10x objective with a fluorescent microscope, count all the fluorescent foci (groups of fluorescent cells) in each well after 2-5 days. Take care not to count the same fluorescent focus twice, and screen all the wells in the same order. This process can be automated with a microscope equipped with a computerized stage and image analysis software. If all fluorescent foci have developed into plaques then units used for the final virus concentration are plaque forming units (PFU). Grow ARPE19 cells in a 24 well plate until they reach 90% confluence (~200,000 cells/well when seeding ~24 h before the infection). These cells are more easily infected at low VZV concentrations as compared to MeWo or MRC5 cells (Schmidt-Chanasit et al., 2008; Pasdeloup et al., 2013). Use 500 µl/well volume to grow and infect the cells. Prepare 5-fold serial dilutions of cell-free VZV in high glucose DMEM. In our experience, diluting the virus in growth medium for cells which are not sensitive to the presence of serum does not seem to affect viral infectivity. Typically, the range of the dilutions is 1:5 to 1:625 of the initial stock. Inoculate the ARPE19 cells with 100-150 µl/well of the viral dilutions in triplicates. In a CO2 incubator, let the virus adsorb to the cell monolayer for 2 h, agitating occasionally. Remove the inoculum and add 0.5 ml pre-warmed growth media per well. No agar overlay is required since no secondary plaques are formed by VZV, which does not release virions into the overlaying medium. Monitor the cells for fluorescent foci formation. Usually, 5 days are sufficient for the foci to be easily countable, but this can vary between viruses and experiments. Using a 10x objective with a fluorescent microscope, count all the fluorescent foci (groups of fluorescent cells) in each well after 3-5 days. Take care not to count the same fluorescent focus twice, and screen all the wells in the same order. This process can be automated with a microscope equipped with a computerized stage and image analysis software. If all fluorescent foci have developed into plaques then units used for the final virus concentration are PFU. Grow Vero cells (green African monkey kidney cells) in a 24 well plate until they reach 90% confluence (~400,000 cells/well when seeding ~24 h before the infection). The use of Vero cells for HSV1 and PRV is documented in Moffat et al. (1998), Nicola and Straus (2004) and Pasdeloup et al. (2013). Prepare 10-fold serial dilutions of the virus in high glucose DMEM. Typically, the range of the dilutions is 10-2 to 10-7 of the initial stock. Keep the dilutions on ice. Inoculate the Vero cells with 100 µl/well of the virus in quadruplicates. Let the virus adsorb to the cell monolayer for 1 h in a CO2 incubator, agitating every 15 min. Remove the inoculum and cover the cells with 1 ml of overlaying medium containing 0.3% agarose per well. Work quickly so that the media will not start to solidify before its addition to the cells. Monitor the cultures for formation of fluorescent foci, usually less than 4 days. If virus without fluorescent label are used, or it is desirable to count plaques rather than fluorescent loci, plaques are visualized by staining cultures with 0.1% crystal violet: Carefully lift the overlaying agar medium using a spatula, taking care to not disturb the cell monolayer. Fix the cells with 100 µl 4% PFA in PBS for 30 min at room temperature. Wash twice with PBS, and add 0.1% crystal violet solution for 10 min. Carefully wash with water until the liquid no longer has traces of blue (usually about 5 rinses). Count the plaques and calculate the PFU/ml as above. In order to calculate the MOI, you should first determine the number of cells you are infecting, and the titer of the virus inoculated on them. Figure 2. Plaque assay for HSV1 gCGFP using crystal violet staining. 4 days after infection, cells were fixed and stained as described in the text. Viral concentration is decreasing from left to right. Crystal-violet stains the cells, which allows the visualization of the clear plaques. An arrow points to the dilution which yielded quantifiable plaques. Control, uninfected wells did not yield any detectable plaques (uninfected). In advance, prepare a stock of 1.2% pure agarose for electrophoresis in PBS by autoclaving. Pre-heat the required amount of medium to 37 °C. Right before use, re-boil the agar in a microwave oven to liquefy it. Dilute the agar with the growth medium at a ratio of 1 agar volume to 3 medium volumes, e.g., add 6 ml agar to 18 ml medium in a 50 ml tube. This will result in 0.3% agar in medium which is sufficient to cover one 24-well plate. Keep the overlaying media tube inside a beaker with ~40 °C water, to prevent solidification. First add the powder to the appropriate amount of 100% ethanol to completely dissolve it, and then add the required amount of water to generate 10% ethanol. The HSV1 titration was based on an unpublished protocol of Dr. Maya Ilouze (Sheba Medical Center, Tel-HaShomer, Israel). We gratefully acknowledge the support of grant from the Israel Science Foundation 238/11 and a donation from the Maximillian Goode Foundation. Eisfeld, A. J., Yee, M. B., Erazo, A., Abendroth, A. and Kinchington, P. R. (2007). Downregulation of class I major histocompatibility complex surface expression by varicella-zoster virus involves open reading frame 66 protein kinase-dependent and -independent mechanisms. J Virol 81(17): 9034-9049. Heineman, T. C. and Cohen, J. I. (1994). Deletion of the varicella-zoster virus large subunit of ribonucleotide reductase impairs growth of virus in vitro. J Virol 68(5): 3317-3323. Markus, A., Grigoryan, S., Sloutskin, A., Yee, M. B., Zhu, H., Yang, I. H., Thakor, N. V., Sarid, R., Kinchington, P. R. and Goldstein, R. S. (2011). Varicella-zoster virus (VZV) infection of neurons derived from human embryonic stem cells: direct demonstration of axonal infection, transport of VZV, and productive neuronal infection. J Virol 85(13): 6220-6233. Moffat, J. F., Zerboni, L., Kinchington, P. R., Grose, C., Kaneshima, H. and Arvin, A. M. (1998). Attenuation of the vaccine Oka strain of varicella-zoster virus and role of glycoprotein C in alphaherpesvirus virulence demonstrated in the SCID-hu mouse. J Virol 72(2): 965-974. Nicola, A. V. and Straus, S. E. (2004). Cellular and viral requirements for rapid endocytic entry of herpes simplex virus. J Virol 78(14): 7508-7517. Pasdeloup, D., Labetoulle, M. and Rixon, F. J. (2013). Differing effects of herpes simplex virus 1 and pseudorabies virus infections on centrosomal function. J Virol 87(12): 7102-7112. Schmidt-Chanasit, J., Bleymehl, K., Rabenau, H. F., Ulrich, R. G., Cinatl, J., Jr. and Doerr, H. W. (2008). 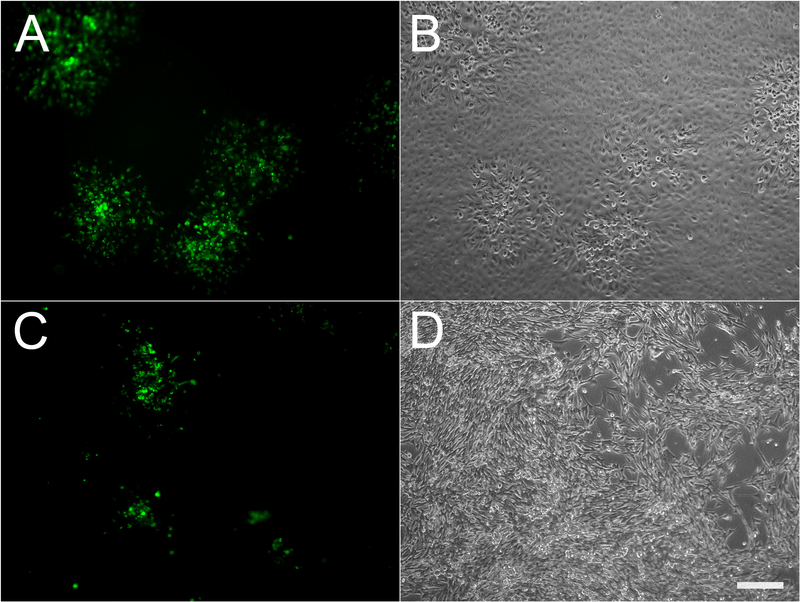 In vitro replication of varicella-zoster virus in human retinal pigment epithelial cells. J Clin Microbiol 46(6): 2122-2124. Sloutskin, A. and Goldstein, R. S. (2014). Laboratory preparation of Varicella-Zoster Virus: concentration of virus-containing supernatant, use of a debris fraction and magnetofection for consistent cell-free VZV infections. J Virol Methods 206: 128-132. How to cite: Sloutskin, A. and Goldstein, R. S. (2014). Infectious Focus Assays and Multiplicity of Infection (MOI) Calculations for Alpha-herpesviruses. Bio-protocol 4(22): e1295. DOI: 10.21769/BioProtoc.1295.